Italcarrelli di P. Lopez s.r.l. was born in 1953 as an artisan company founded by Pasquale Lopez with great entrepreneurial spirit, developing the growth and improving of the company throughout the years. Today it has the principal office in Monterotondo at about 20km from Rome with business factory and project and administration offices, on an area of 4700 square meters. The versatility of the offered products, whose functionality, solidity and style, based on the high quality of materials and the constant perfection of working techniques, has always found greater placement and appreciation in the sectors of restoration and ” great communities” such as Hospital sector and Religious and private institutions, without neglecting the tourism area, with more than 3000 clients in Italy and abroad. The industriousness and the hard work of the company have been recognized and acknowledged during the years by great national industries, in particular by the Ferrovie dello Stato ( Italian Railways) that have commissioned the Italcarrelli firm for more than 160 on board special facilities usually used for catering and refreshments, since 1986 with an important liasion with the ETR 450 Train (Pendolino) and in 2002 with the on board equipment contract for the DSB Danesi Railway wagons. 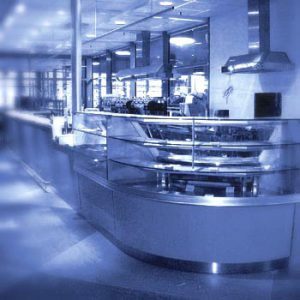 Furthhermore,in the last six years, ITALCARRELLI has produced and constructed various restoration points in strategical positions such as airports and railway stations in association with international renowned companies and leaders in the commercial catering sector. Bringing in this way new prestige for our brand. ITALCARRELLI is able to perform any type of carpentry work in stainless steel, also combined with mechanical and electronic systems on its own project designs or else requested by customers. In the last years, thanks to substantial investments for the acquisition of new high tecnology machinery, the company has developed the capability to operate as prime contractor in many complex market activities where the supply of specialized provision material is necessary. This in order to acquire the experience for project construction of large polyfunctional systems. (Kitchens, Bars, Self-service items, Pizza and Coffe corners, Free-flow market, etc.). 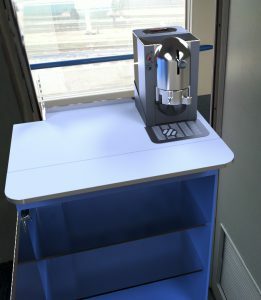 In the thirty years of experience gained in the various sectors of food and beverage for collective and railway catering, ITALCARRELLI entered into a fundamental market niche such as the furnishing of modern and functional decor. The analysis of different functional and design needs has made it possible to study, standardize and apply to new modular building techniques thus allowing the reuse of structure furniture representing an element of economic projectual design in the conditions of a locative mobility. The study and realization of turnkey projects, finally, guarantees the customer homogeneity and maxmimum integration of all the functional elements necessary for furnishing.